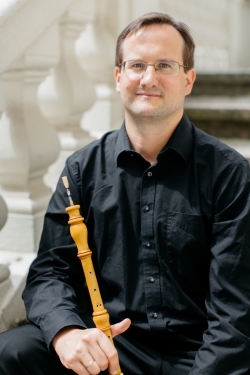 Andreas Helm studied recorder, oboe and methodology with Carin van Heerden at the Bruckner Konservatorium in Linz, where he completed his degree in 1999. Subsequently he studied baroque oboe with Alfredo Bernardini at the Conservatorium van Amsterdam graduating in 2002. From 2001 to 2003 he was principal oboe and solo recorder player with the European Union Baroque Orchestra. He is a member of Rossi Piceno, Barocksolisten München and Schikaneders Jugend, a trio performing alpine folk music from around 1800s. Together with the conductor Heinz Ferlesch he found the period instrument group Barucco. In addition he plays both oboe and recorder with a large number of European orchestras and Ensembles including Irish Baroque Orchestra, Freiburger Barockorchester, Concerto Köln, Les Musicien de Louvre, Academy of Ancient Music, Hofkapelle München and Concentus Musicus Wien. He has toured extensively all over Europe, USA, Mexico, Singapore, South Africa and the Far East. He is the recipient of several international prizes and awards including the Bonporti Prize in Rovereto, Italy and the Gradus ad Parnassum award in Eisenstadt, Austria. In recent years he has been invited to lead the Hrvatski Barokni Ansambal, the Cork Baroque Orchestra and the Norwegian Wind Band. Andreas Helm is the artistic director of the Aestas Musica Summer School of Baroque Music in Varaždin, Croatia. He is professor for period oboe-instruments at the Kunstuniversität Graz and at the Musik und Kunst Privatuniversität Wien and has been invited to give Masterclasses many different institutions throughout Europe.